Referring to Problem 359, if T = 30 kN and x = 1 m, determine the angle θ at which the bar will be inclined to the horizontal when it is in a position of equilibrium. Referring to Problem 359, what value of T acting at x = 1 m from B will keep the bar horizontal. A 4-m bar of negligible weight rests in a horizontal position on the smooth planes shown in Fig. P-359. Compute the distance x at which load T = 10 kN should be placed from point B to keep the bar horizontal. A bar AE is in equilibrium under the action of the five forces shown in Fig. P-358. Determine P, R, and T.
For the assembly in Fig. 271, find the stress in each rod if the temperature rises 30°C after a load W = 120 kN is applied. 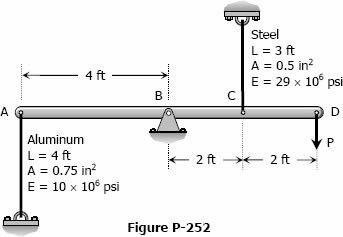 A rigid bar of negligible weight is supported as shown in Fig. P-271. If W = 80 kN, compute the temperature change that will cause the stress in the steel rod to be 55 MPa. Assume the coefficients of linear expansion are 11.7 µm/(m·°C) for steel and 18.9 µm/(m·°C) for bronze. As shown in Fig. 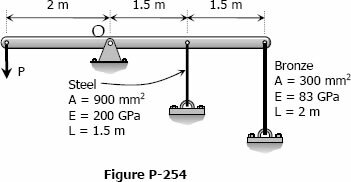 P-254, a rigid bar with negligible mass is pinned at O and attached to two vertical rods. Assuming that the rods were initially stress-free, what maximum load P can be applied without exceeding stresses of 150 MPa in the steel rod and 70 MPa in the bronze rod. The light rigid bar ABCD shown in Fig. P-252 is pinned at B and connected to two vertical rods. Assuming that the bar was initially horizontal and the rods stress-free, determine the stress in each rod after the load after the load P = 20 kips is applied. The two vertical rods attached to the light rigid bar in Fig. P-251 are identical except for length. Before the load W was attached, the bar was horizontal and the rods were stress-free. 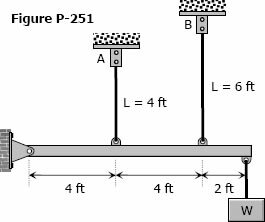 Determine the load in each rod if W = 6600 lb.